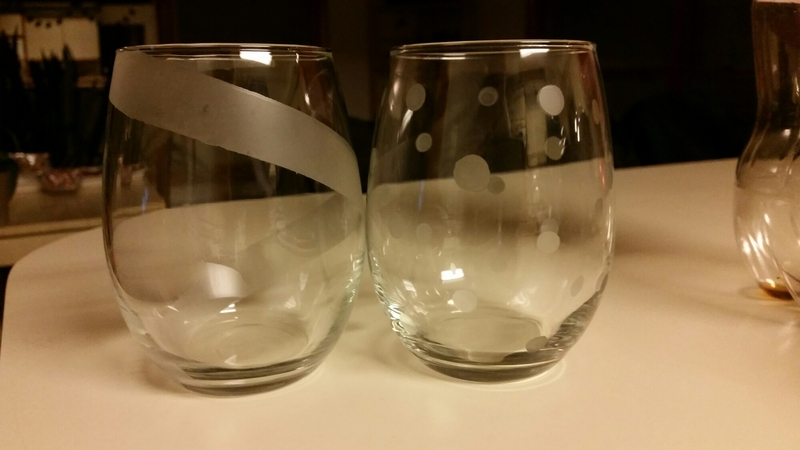 Etched Wine Glasses – Move Over Martha, I'm Here! Let me tell you a story, about the time I became obsessed with etching glasses. Let’s start with the glasses. $1 each from Target. Stemless. Dishwasher safe. You can’t order online, but I ordered for store pick up and was so easy. Very appropriate in size to hold my 8oz. Wine pours of Fontana Candida Frascati, which if you love Italian whites or pinot grigios, you should try. It’s awesome. And cheap. $8.99/bottle in PA. So moving on to the supplies, from Michaels of course. If you’re a teacher or student, show you ID for 20% ALL the TIME. Or sign up to their mailing list for new coupons and savings every week. I stock up on my favorites when they’re on sale!! Supplies, right. I used a few different brushes or foam brushes, depending on the stencil/pattern. If you’re planning for a stencil, MUST be adhesive reusable. And don’t go cheap on this either as the higher priced ones will last MUCH longer, making them COMPLETELY worth their money. The initial stencils are made by my #1 gal THE Martha Stewart. 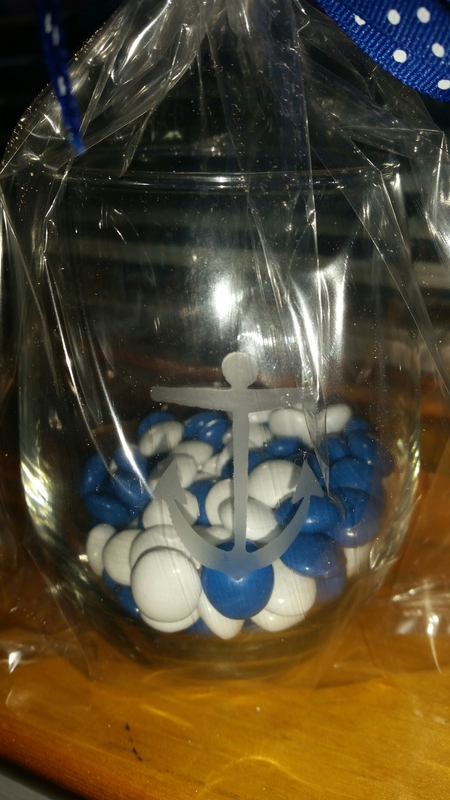 Then I made the mistake of buying a cheap one for the anchor pattern, and the stencil ripped on the FIRST glass. 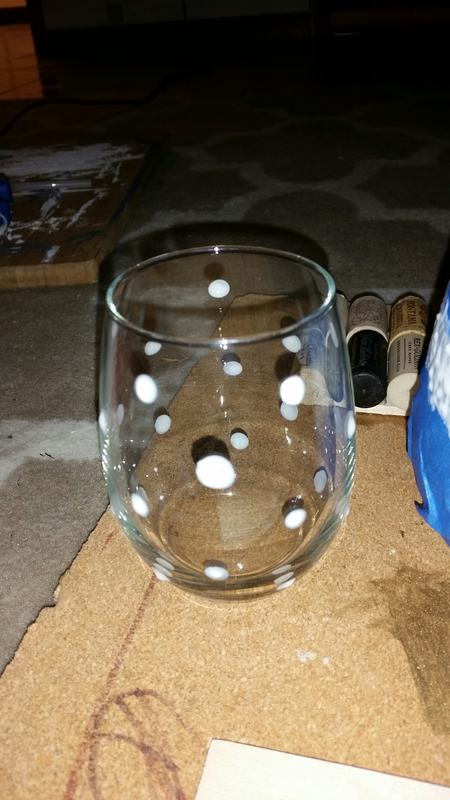 Had to buy another one rush order, as was making 50 glasses for parting gifts at my friends bridal shower. No bueno. So, the etching cream runs you at $13.88/bottle, but has lasted me for about 65 glasses so far and is still going. 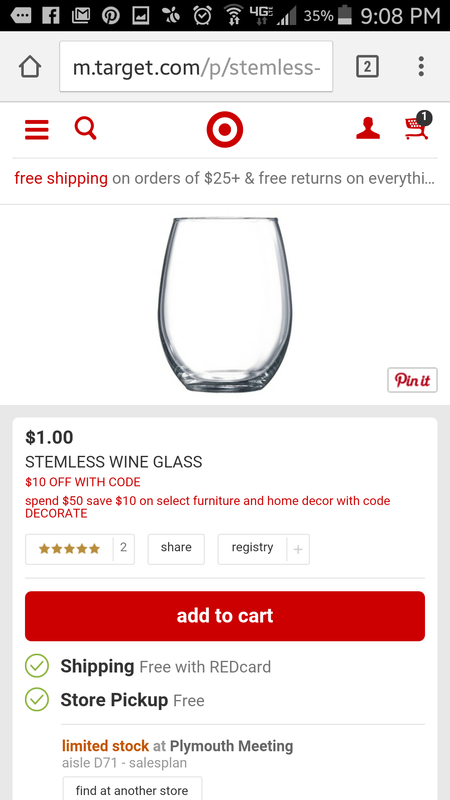 Which brings your grand total to about $1.50/glass, including etching cr ew am, glasses, brushes, stencil. Pretty legit. 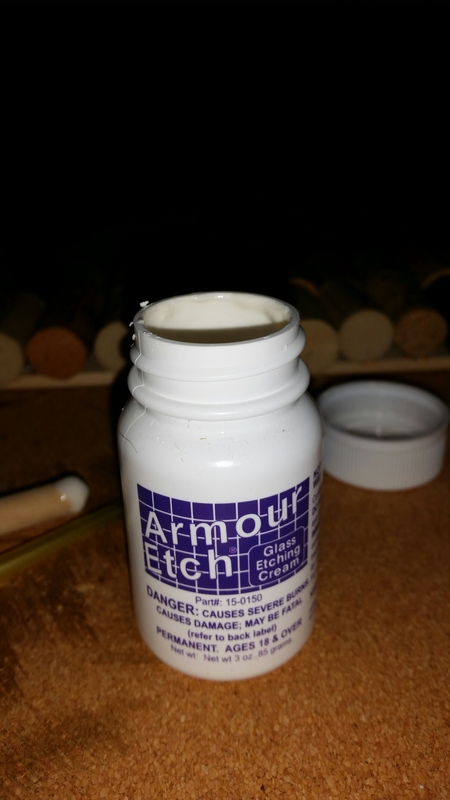 It’s literally this easy: pick stencil, paint on etching cream, let sit for one minute. I rinse cream off with water, than hand wash with a little soap and warm water, let dry… VOILA!! I’ve put mine in the dishwasher a TON of times, and the glasses are in perfect condition. Look for deals on the stencils as they’ll be the most expensive part. But since they’re reusable, as long as you take good care of them, you’ll really get your money’s worth. Below are some photos of the free hand ribbon I designed with painters tape, and the polka dots I designed simply using the wooden handle of a 49cent foam brush. The end was just the perfect size. And then you only spent 49 cents TOTAL for your stencil. I love to hear other people’s success stories, so please share with me!! 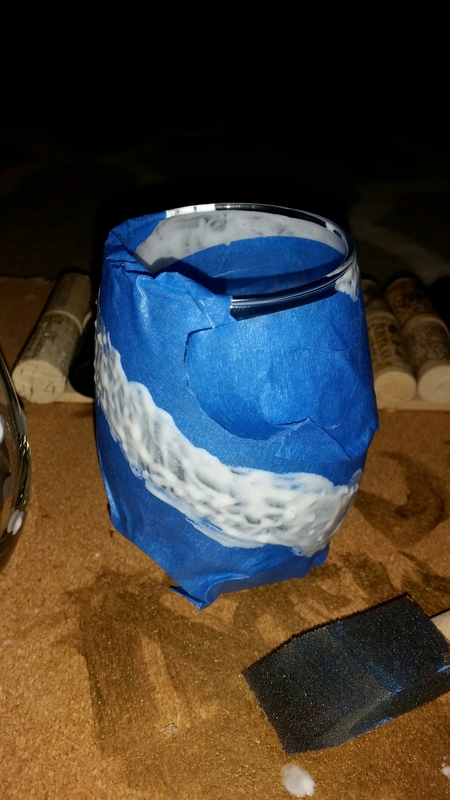 I’ve always wondered how people make etched glasses! 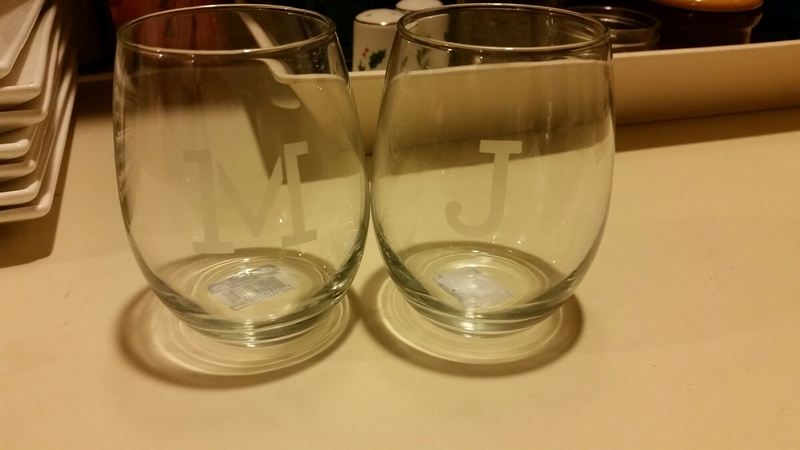 Wow did I get ripped off paying for pre-etched designs….